Navayuga Engineering Company Limited (NEC) recently entered the Guinness Book of World Record for concrete pouring. 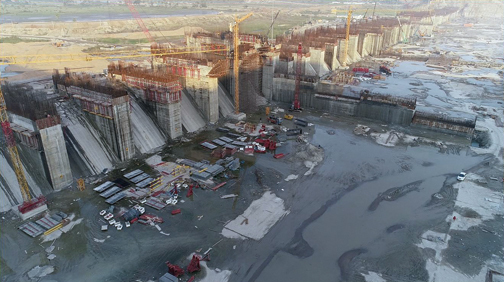 The flagship entity of the Navayuga Group which is currently building the world’s largest flood discharge capacity dam at Polavaram, in the Andhra Pradesh region of India, successfully set 2 Guiness World Record® achievements at the site: “most concrete poured in 24 hours” and “largest continuous concrete pour”. The company created the world record by pouring 32,315 m3 of concrete in 24 hours. The concrete work to make the spillway began at 8 am on Sunday, January 6, and was concluded at 8 am the next day, January 7, 2019. It was the unparalleled planning and engineering skills of NEC that made possible a task of such mammoth proportions. Accredited the status of a national project, Polavaram witnessed 20 agitator trucks delivering concrete from 10 batching plants and 90 transit mixers that were engaged in this incredible engineering feat. The attempt was monitored by an official adjudicator from Guiness World Record® in the presence of Hon’ble Chief Minister of Andhra Pradesh, Sri N. Chandrababu Naidu. As India’s leading infrastructure company, NEC has many achievements to its credit with iconic projects accelerating India’s transformation. These engineering marvels include India’s longest river bridge Dhola-Sadiya, Dibang-Lohit River Management System, the longest highway tunnel project, Quazigund to Banihal, largest port on the east coast of India – Krishnapatnam Port and many more. Showcasing NEC’s superior and world-class engineering capabilities; the project once completed will irrigate a massive ayacut of over 72 lakh acres (2.9 million ha) in 2 phases and influence the supply of water to all 13 districts of Andhra Pradesh. The project envisages meeting the water supply needs of an aggregate population of 20 million. 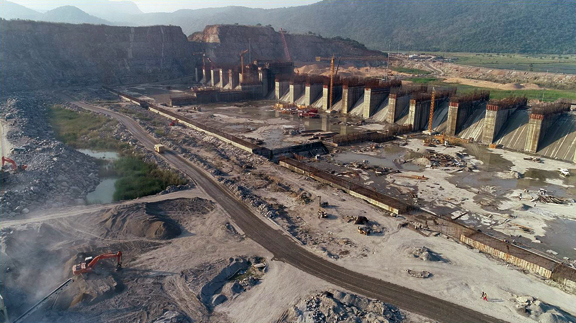 The Polavaram Project is a mega infrastructure landmark with a total of 48 gates, each 20 m high, and a width of 16 m and spanning a total of 1,119 m. It required pouring 3.67 million m3 of concrete and placing 50,000 t of steel, all in record time to complete the project that had been on the cards for many years. Designed to withstand massive floods that could occur once in 1000 years, the Polavaram Spillway is set to have a discharge capacity larger than the 3 Gorges Dam of China.